Q: John, how can I be in this space and do things? How do I find this space and take care of the needs of my kids? I came here tonight because I felt overwhelmed by the responsibility. With all the caring I have for my daughter there also comes anxiety. How to do it? John: In the same way that you are in this, in what this space is for you: the way of openness and softness of heart. John: Say “yes” as this and say “no” as this. When you say “no” to her as this, you meet with her and she is loved. She’s seen and she’s known. That much alone exceeds the best parenting. On the surface, if you do many things wrong but come from this, she’ll get it right. Or on the surface do everything that’s right and don’t come from this, and she’ll be confused. Q: How do I anchor in this? John: Without using your self to do so. Then she’ll see in you how she also doesn’t need to use her self to anchor within. She’ll be learning quickly what matters most. She’ll grow up seeing it. What she is seeing in being with you is that what this is matters more to you in your heart than your own self matters to you in your heart. She’ll love coming from the same. She’ll experience from you that this, within, matters more than her self, giving her an anchoring within that doesn’t come from her self. It comes from her knowing and being the truth that she knows in her heart. She’ll grow up witnessing and experiencing from you a living orientation that she knows the truth of. You’ll be giving her no reason to be lost. When knowing means more to you than seeing, and seeing means more to you than experiencing, she’ll be realizing what she is, easily and quickly. She’ll be growing up in it. Q: A doubt arises that I am as capable of this as I would like to be. 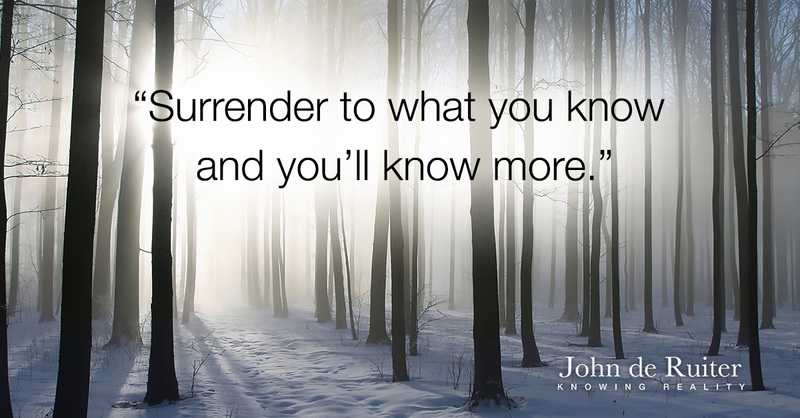 John: Has doubt ever informed you of what you do know? John: Then don’t listen to your self concerning what you do know in your heart, and she’ll be learning from you the same. She’ll grow up being clear in what isn’t common. Q: It’s the first time I’ve experienced caring in this way. It’s something of a change. Sometimes, however, I feel tied down, confined. John: Don’t believe your self. Don’t believe your self, for what you know within matters more than what your self is. That has you drawing from what does matter most, even if you’re not understanding it or seeing it. You’ll still live being rooted in it. You’ll be growing within, in a way that isn’t informed by your past. It isn’t informed by your learning. It isn’t informed by what you acquire with your mind. The growing within is informed only by what you know the truth of in your heart. However little that is, that means the most to you. So then you trust it and you believe what you’re knowing instead of trusting and believing something of your self to inform you of what you know doesn’t come from your self. When you are rooted in knowing within, from everything that you have gleaned in your past in your self, it will seem that you’re rooted in coming from within what is so little while you are knowing that it’s everything. That will have you as awareness in your heart being something that is different from what your self is. And as you sustain being that in your heart in the midst of your self, your self will slowly become the same. There’s no rush at all for your self to become as this because you know that you are able to come from this in an instant. You’re able to be what this is in you without a single movement in your self. That’s what enables, in time, your self to rest and to no longer have to produce for you what you’ve been requiring of it, knowing that what you’re requiring of your self is something that is other than you’re your self is. Your self isn’t able to produce for you what you are, in what is deeper than your self. You are able to produce in your self what you are, in what is deeper than your self. That has you, as awareness, being the provider for your self and relieving your self of having to be that. That leaves your self unburdened by you, enabling your self to rest concerning everything that is deeper than what your self is.You are more than your self and if that’s what you’re coming from within, your self rests in that. Your daughter will also be growing up resting in that. Because of you it will be what is most real to her. She’s growing up with it. She won’t need to go all of the different ways that you have gone. Q: I want to ask you about gentleness in the face of injustice or inappropriate behaviour. I’ve been told in the past that I should toughen-up, but I struggle with how to articulate with clarity when I see something that is wrong. How can I discern a true voice in that? How Can I Help Others Heal? Q: For some time I’ve been feeling that my purpose on earth is to help people heal, not as much physically as spiritually. What inside of me needs to open or develop to be able to do so? Q: John, I’m curious about how you were awakened. How did you remember who you are? Get Emailed Every Time We Upload! This site is created and maintained by a team at the College of Integrated Philosophy. JdR Gems Copyright 2019 © All rights Reserved.